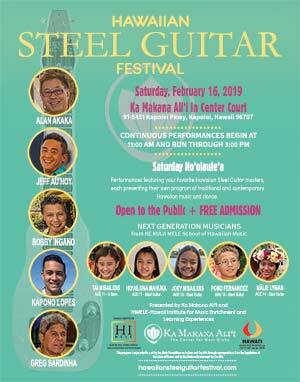 The Hawaiian Steel Guitar Festival at Ka Makana Ali'i will feature six of Hawai'i's steel guitar masters and the Next Generation Hawaiian steel guitar players from the Ke Kula Mele Hawaii School of Hawaiian Music. These Next Generation players range in age from 11 to 14 years old. Performance times will be posted when they are finalized. Alan Akaka - 11:00 A.M.
Kapono Lopes - 11:40 A.M.
Bobby Ingano - 12:20 P.M.
Jeff Au Hoy - 1:00 P.M.
Ke Kula Mele NextGen Steel Guitar Players and Musicians - 1:40 P.M.
Greg Sardinha - 2:25 P.M. These "NextGen" Steel Guitar students of Ke Kula Mele Hawaii School of Hawaiian Music will perform for festival attendees' enjoyment. The Hawaiian Steel Guitar Festival at Ka Makana Ali'i poster was designed by Addison Ching and features pictures of the master performers superimposed on a silhouette of a 1952 Fender Champion steel guitar. Click on the thumbnail for a larger view. The Festival Archives contains program information from previous Ka Makana Ali'i festivals.